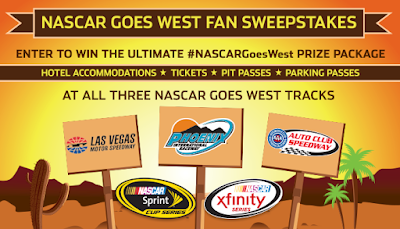 Enter to win tickets for you and a guest to attend the NASCAR®-sanctioned racing events at the Las Vegas Motor Speedway in Las Vegas, NV during the weekend of March 4-6, 2016; at the Phoenix International Raceway in Phoenix, AZ during the weekend of March 11-13, 2016; and at the Auto Club Speedway in Fontana, CA during the weekend of March 18-20, 2016. It is easy to enter, just click here and complete the brief entry form*. It costs nothing to participate.